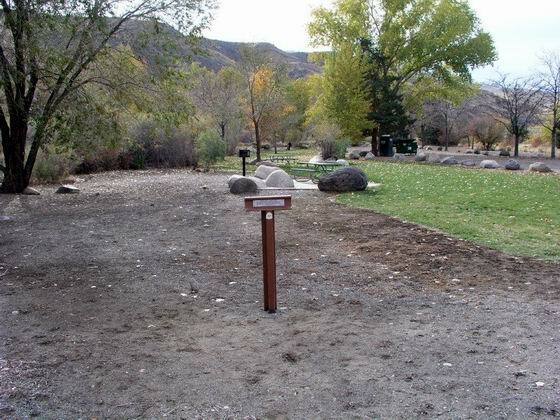 When the Truckee Trail leaves the Sink area, it enters the most difficult terrain that the emigrants would face on their entire journey along the California Trail. 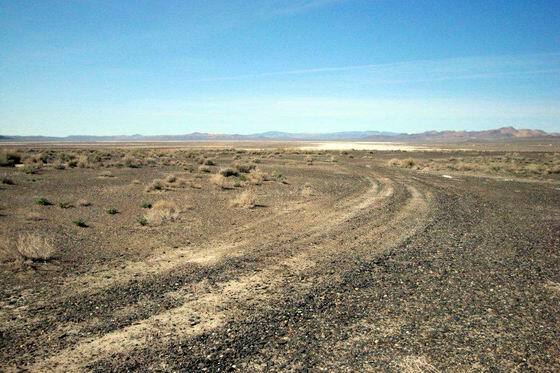 The first obstacle was the extremely dry, hot, sandy and desolate country of the Forty Mile Desert. 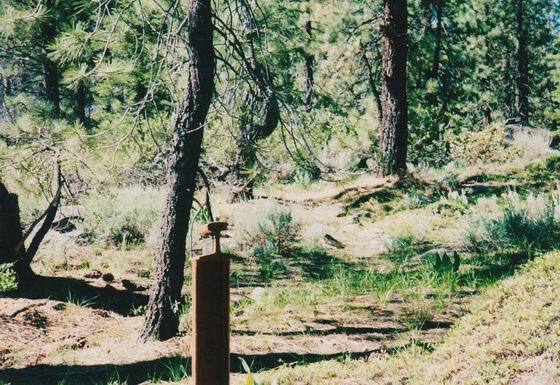 The only water along this terrible stretch of trail to the Truckee River was the alkaline impregnated hot springs located about midway through this water-less stretch. 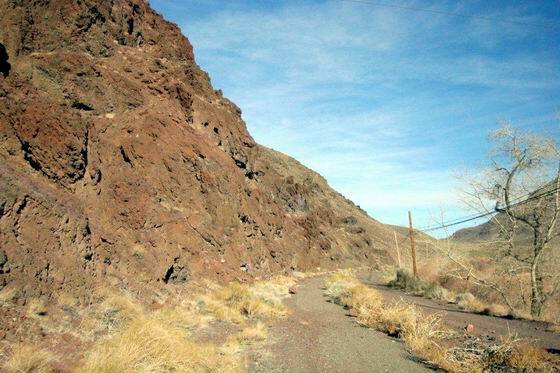 Upon reaching the river at present Wadsworth, Nevada, the trail continues west as it follows the river through a long, narrow, rocky canyon that required crossing the river many times. These river crossings were the second obstacle. 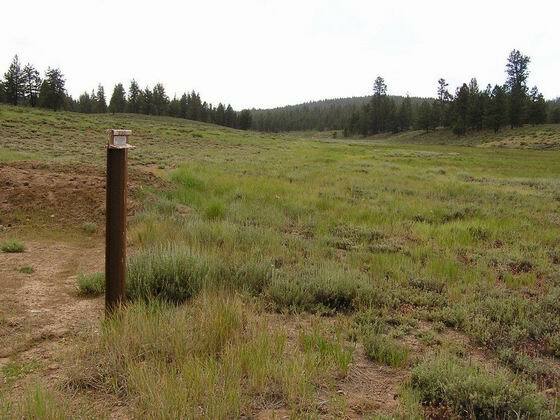 Soon after the 22nd crossing, the canyon opens up into Truckee Meadows. 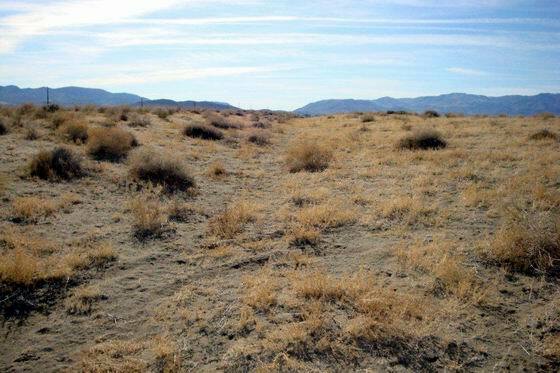 Here the emigrants found lush forage, adequate wood and plenty of water. 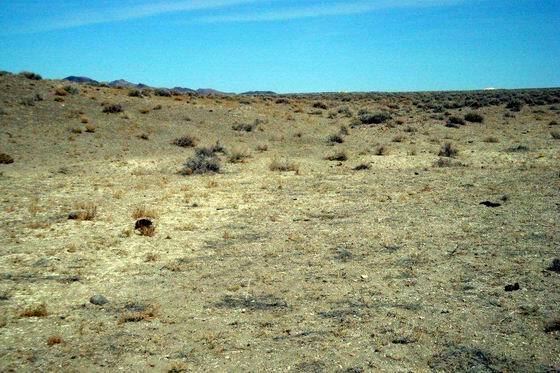 This location provided an opportunity for them to recruit themselves and their nearly-dead animals before taking on the “Elephant” that lay shortly ahead. 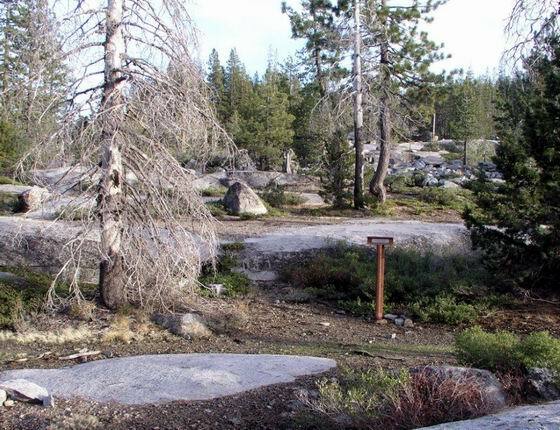 From the Meadows, the trail soon jogs north to pass through Dog Valley before returning to the river at present day Truckee. At this point, the emigrants really saw the “Elephant” as they faced the third obstacle which was the formidable task of crossing the Sierra over Stephen’s Pass. 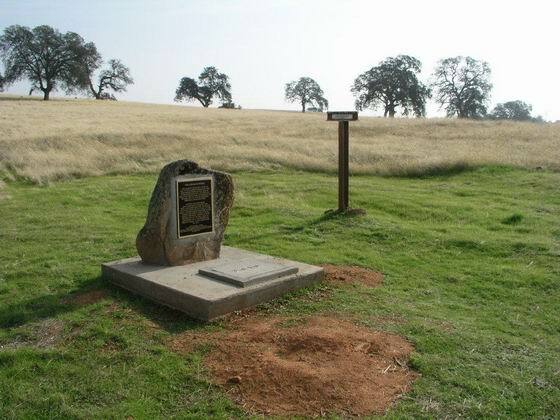 Once across the summit, the journey down the rocky, steep, heavily-timbered ridges and along the boulder-strewn streams was the fourth and last obstacle although travel was still very difficult until their destination at Johnson’s Rancho in the Sacramento Valley was finally reached. 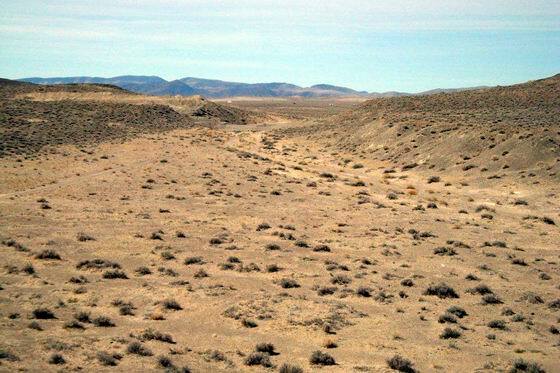 The Elisha Stephens party had proved that there was a viable wagon route over the Sierra Nevada into northern California but it took further overland emigrant parties, later in 1845 and in 1846, to work out the final wagon route alignment from the Truckee River to the Sacramento Valley. 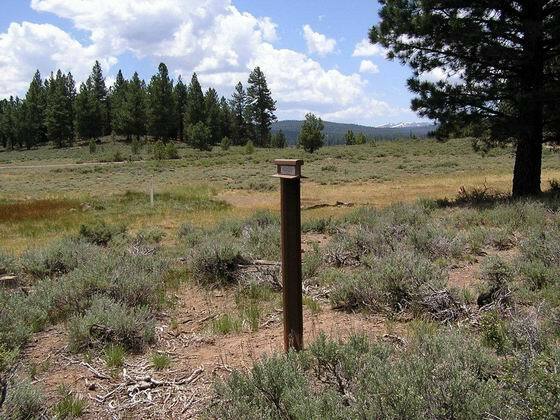 By 1850, because the travel on the Truckee Trail was so difficult, it was seldom used. 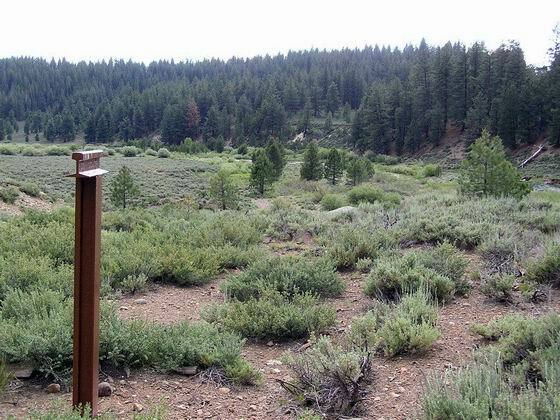 Most of the western migration traveled on the newly opened Carson Trail. 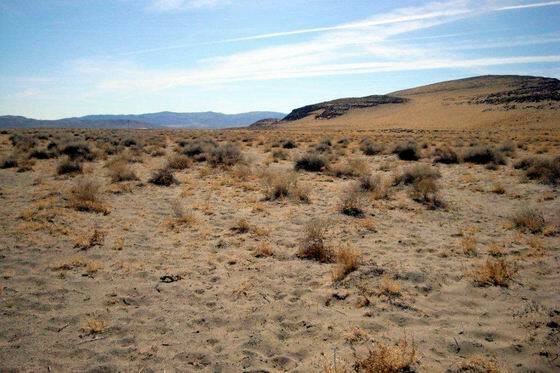 The trail heads southwest across the level, sandy soil along the west edge of the Humboldt Sink. Photo by Bob Black. 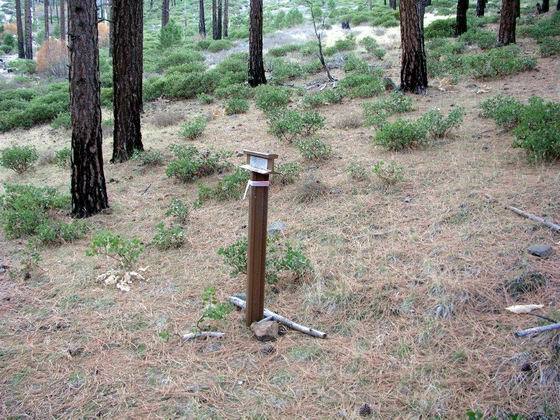 The trail soon leaves the Sink and climbs up to the top of the Humboldt Bar. 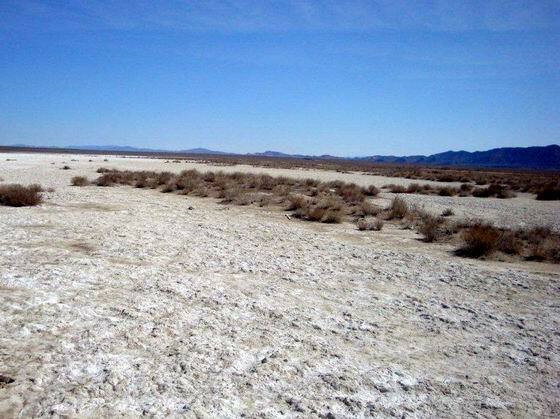 This Bar, located at the northeast side of the Forty Mile Desert, is a unique geologic feature that is thought to have been created by wave action on pre-historic Lake Lahontan when it covered this area. Photo by Bob Black. 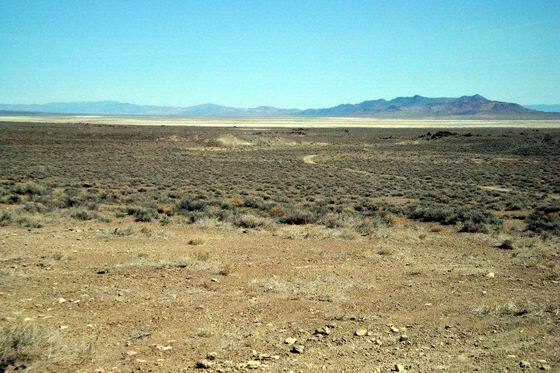 The trail drops down from the Humboldt Bar and now continues southwest, along the northwest edge of the Forty Mile Desert, across salty, sandy soil. Photo by Bob Black. 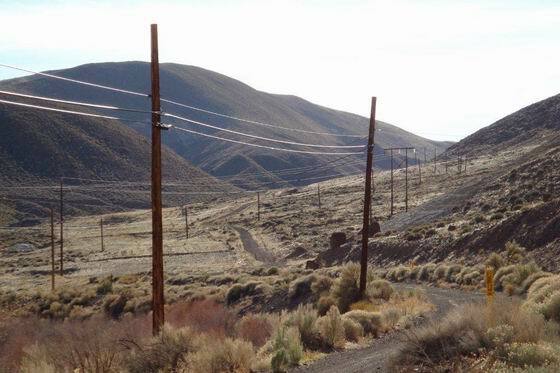 As the trail continues along the edge of the flat level plain at Marker T-4, it crosses what emigrant William Chamberlain described as “a dreary…dusty alkalie road.” The roadbed of the later Central Pacific Railroad follows closely along the trail. Photo by Bob Black. 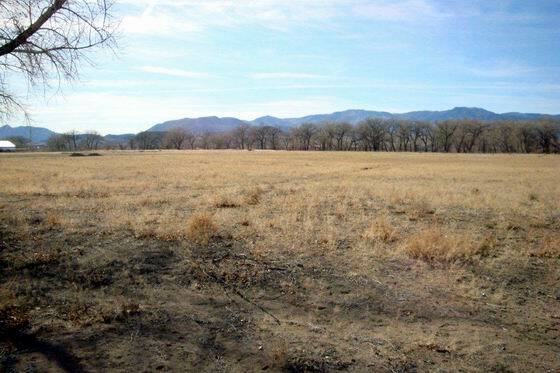 As the emigrants continue along the trail, which is now a dirt road, they leave the flat, level plain for a short distance and pass over a small, rocky, brush-covered mountain. 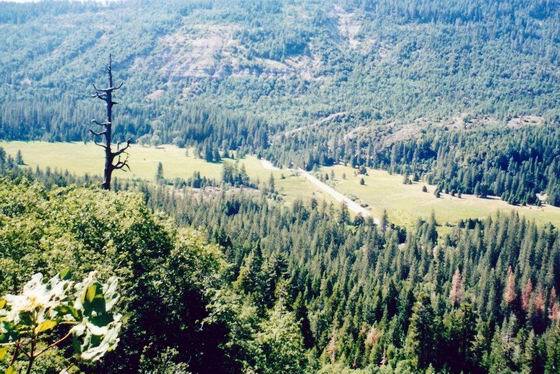 After passing over the small mountain, the trail, still a dirt road, descends to a small valley. It follows the valley through terrain that emigrant Augustus Burbank referred to as “a narrow avenue with low mountain ridges on both sides.” Photo by Bob Black. 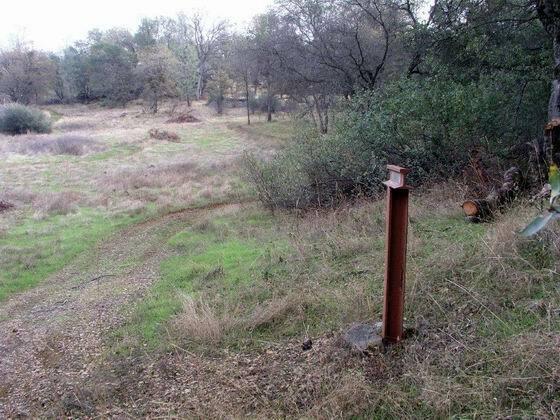 The dirt road/trail follows along a small ridge in the salty, rocky soil a short distance west of the modern I-80 freeway. Photo by Bob Black. 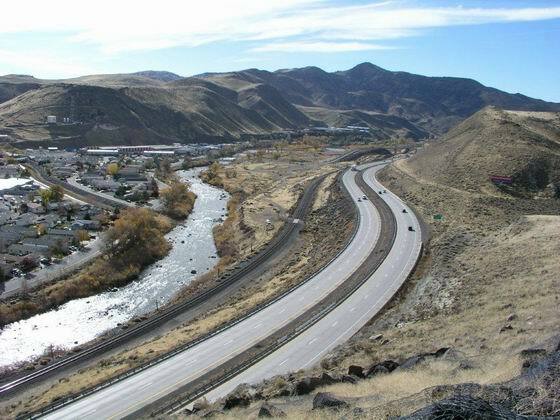 The trail comes down from the small ridge as it heads more southerly toward the I-80 freeway and the hot springs area. Photo by Bob Black. 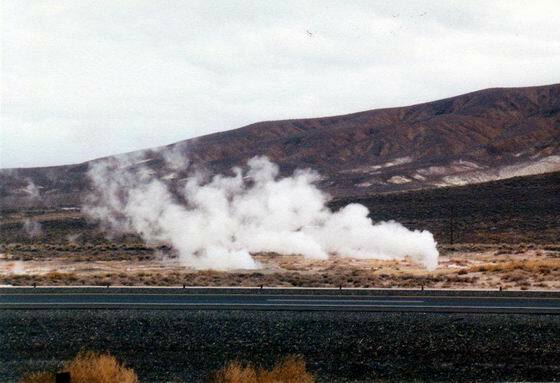 The present hot springs are visible along the east side of the freeway as the trail heads south past the modern geothermal development in the area. Although the water in the hot springs was very alkaline, it was necessary to drink it after the twenty miles of hot, dry travel. Heinrich Lienhard, a young emigrant, described his experience with the water. “The exceptionally bad water of the sink and the water which I had drunk from the hot springs was beginning to show its effect upon me, causing sharp cramps in my stomach followed by continuous diarrhea.” Photo by Bob Black. The trail continues southwest, crossing a stretch of fairly hard, sandy soil on the Forty Mile Desert, toward the point of the ridge shown in the center-background of the photo. 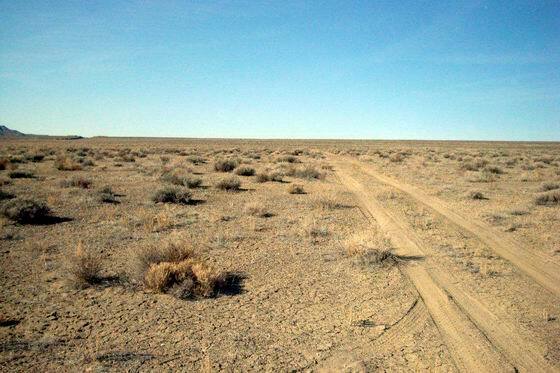 As the trail approaches the location of Marker T-10, the emigrants entered the dreaded area of deep, soft sand. Emigrant Eliza Ann McAuley described it simply as “the road here becomes very sandy and heavy.” Photo by Jim Moorman. The sand got deeper and more difficult for the oxen to pull the wagons through as the trail continues southwest toward the point of the ridge. 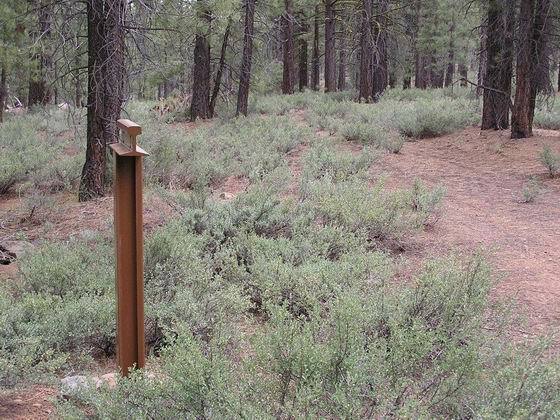 Several possible emigrant graves have been spotted along this section of trail. Photo by Bob Black. 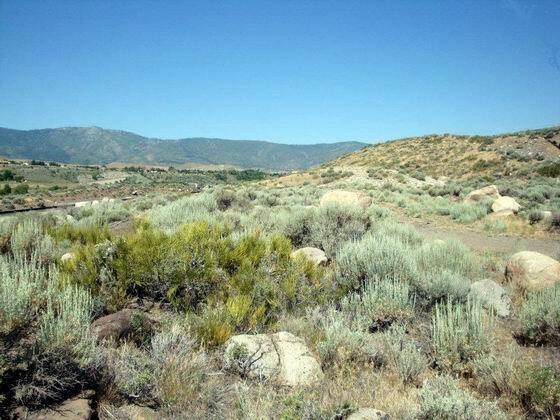 The trail turns west around the point of the ridge, and heads toward the Truckee River, now only about four miles further west, across more deep, soft sand. 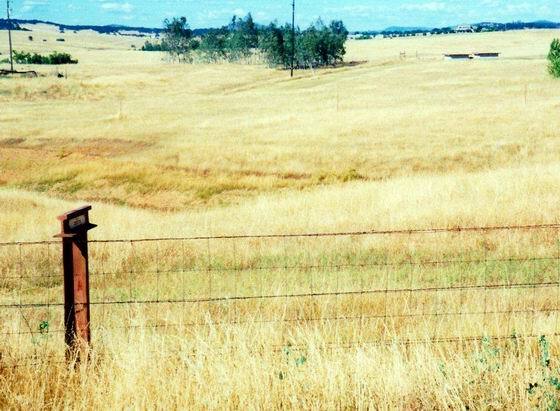 One emigrant, Helen Carpenter, noted that “the road on both sides was strewn with dead cattle. A number in our train succumbed to the heavy travel and heat.” Photo by Bob Black. 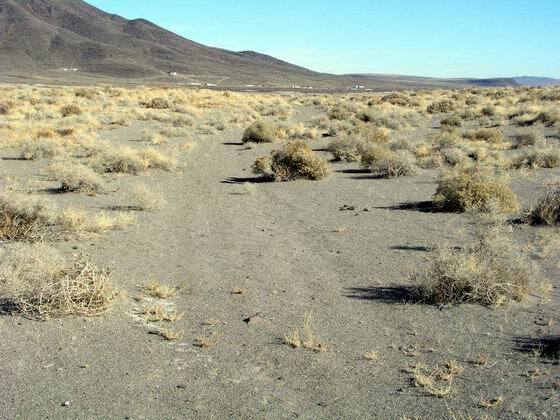 The trail continues west, now shown in the center of the photo, as a deep swale in the soft sand along the roadbed of the later Central Pacific Railroad. Photo by Bob Black. 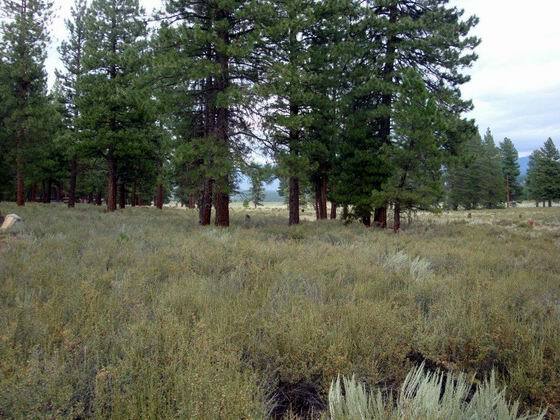 At this location, near Marker T-13 the emigrants were only about a quarter-mile from the Truckee River as identified in the photo by the line of trees. By now, most of the oxen had smelled the water and were making a mad dash for the river. One emigrant, Marlett Foster Cummings, expressed her feelings and probably those of the other emigrants when she said “we struck the Truckee River, beautiful, clear water and quite a large stream, a perfect godsend after the destitution and miserably unhealthy water we have had for hundreds of miles.” Photo by Bob Black. Once in the canyon, the trail crosses back and forth across the river in order to avoid the steep, impassable side slopes. John Steele, an emigrant in 1850, described the situation very well with these words: “Following up the Truckee, on a sandy road, in four miles an abrupt mountain shut out the valley, compelling us to cross the stream, which we found quite dangerous because of the swift current and deep water.” Photo by Bob Black. After travelling through the canyon for about two miles, the trail passes a very high, reddish rock bluff. According to emigrant D. B. Andrews, there was “only room enough to admit of the passage of the team between the river on the left and the high towering rocks on the right.” Photo by Bob Black. After leaving the “red bluff” site, the trail continues southwest, still crossing back and forth across the river, for about eleven miles. Here, the side ridge on the north side of the river came all the way down to the river’s edge. Now the emigrants had to make a choice; either cross the river or climb up and over the side ridge. Apparently, many of the emigrants decided to cross the steep, rocky ridge and then make the steep and rocky descent back down to the river. After the descent from the ridge, the trail route turns left and heads toward the flat bench along the edge of the river. It comes into the photo from the ravine in the right-center of the photo. Once the trail was back down along the river, it heads west for about a mile to the 22nd river crossing. 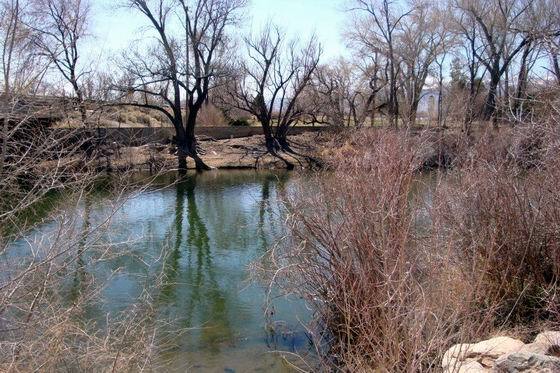 This is the last time the trail crosses the river before entering Truckee Meadows. Photo by Jim Moorman. 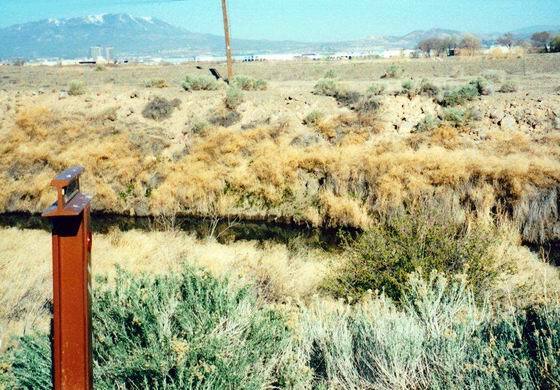 The last obstacle the emigrants faced before reaching the lush Truckee Meadows was the deep, steep-banked slough now called Steamboat Creek. One of the young emigrants, Harriet Ward, describes how the creek was crossed: “with our wagon box raised and our wheels locked, down we plunged.” Photo by Bob Black. 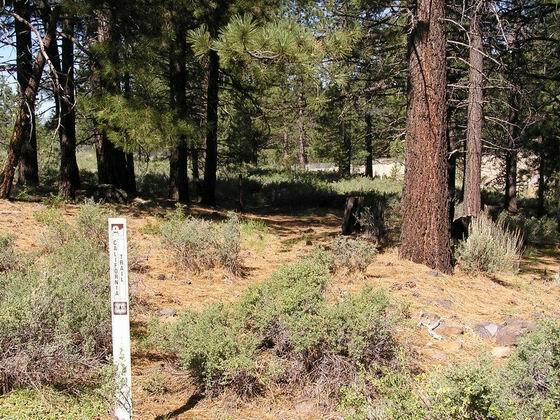 Once across the creek, the trail heads west along the south side of the Truckee River for about two miles to the 1851 junction with the Beckwourth Trail. 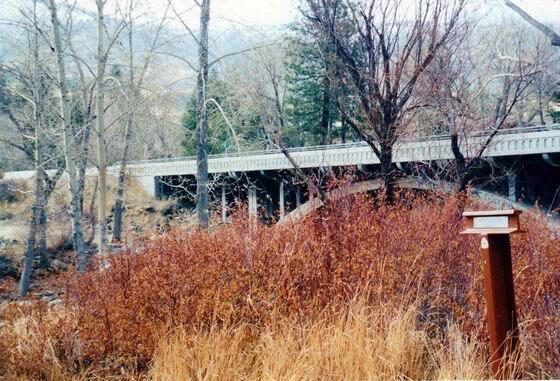 The photo was taken from the north side of the river and shows about where the Beckwourth Trail forded the Truckee River and headed north. Photo by Bob Black. This is the site of the 23rd trail crossing of the river which was quite difficult due to the large, round boulders in the channel. The trail route is now on the north bank of the river in a small public park. Photo by Jim Moorman. 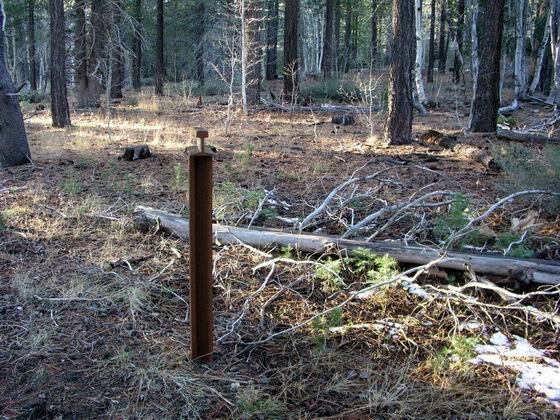 The trail passes through a fine forest and finally reaches the last crossing of the Truckee River, the 27th one. 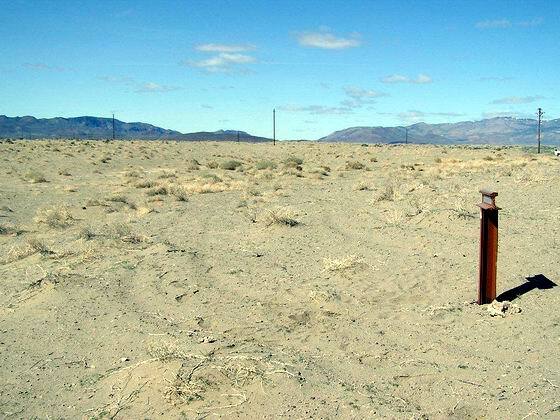 The site of this crossing is located near Verdi, Nv. in what is now the Crystal Peak Park. Photo by Bob Black. The trail is now heading northwest as it climbs up the gradual, tree-covered slope at the mouth of a large, rocky ravine. Emigrant Isaac Wistar commented that “large pines, firs and cedars abound…some of which are fully six feet through.” Photo by Bob Black. As the trail nears the top of the gradually sloping, tree-covered ridge, it turns to the right and descends through the timber to a ravine. Photo by Jim Moorman. The trail heads north a short distance to the head of the ravine and the top of the ridge. After reaching the ridge top, the trail bends to the right and immediately begins the steep, quarter-mile long descent to Dog Valley. Photo by Bob Black. After making the scary descent, the emigrants paused. Emigrant Sarah Davis summed up the situation by remarking that “we have now come over the mountain to a valey whare there is grass for the cattle and now we stop to feede…there is a small creek running here which answers for our use and for the cattle.” Photo by Bob Black. 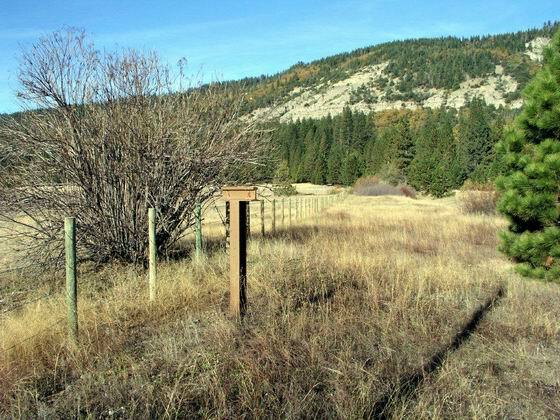 After recruiting their livestock, the emigrants followed the trail southwest, up the gently- climbing creek and along the base of the ridge, through a pine forest, to the top of the ridge where they got their first peep of the Sierra. Photo by Bob Black. The trail continues southwest down the small, gently-sloping, tree covered Hoke Valley to the trail junction. 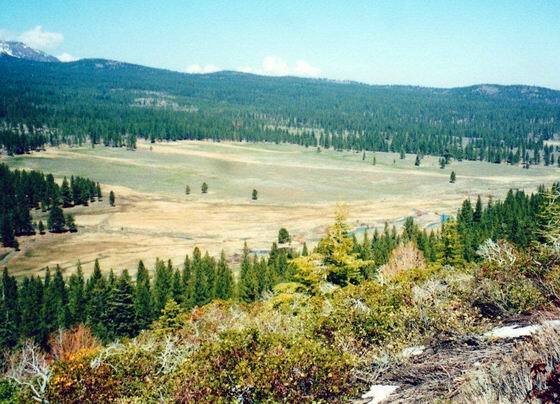 In 1852, the Henness Pass Road branched off to the right from the Truckee Trail. It passed near the location where the photographer was standing. Photo by Bob Black. 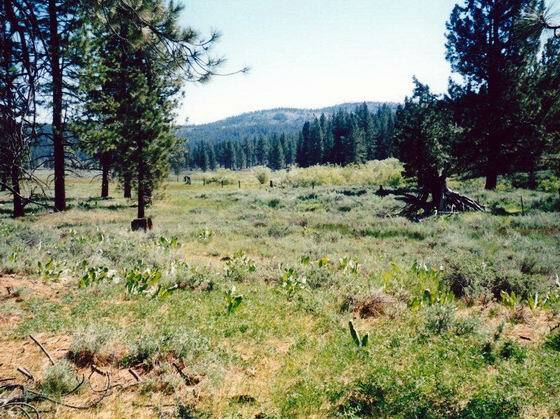 After continuing southwest down Hoke Valley to the Little Truckee River, the trail crosses the river and climbs up to the east end of Russell Valley. One emigrant, Edward Harrow, liked what he saw and remarked that “ we came to splendid feed in a valley.” Photo by Bob Black. At the west end of the valley, the trail turns south and heads up a gently-sloping, ridge covered with a heavy growth of timber. Photo by Bob Black. Leaving the heavy timber on the ridge, the trail continues south into an open meadow and Prosser Creek. Photo by Bob Black. 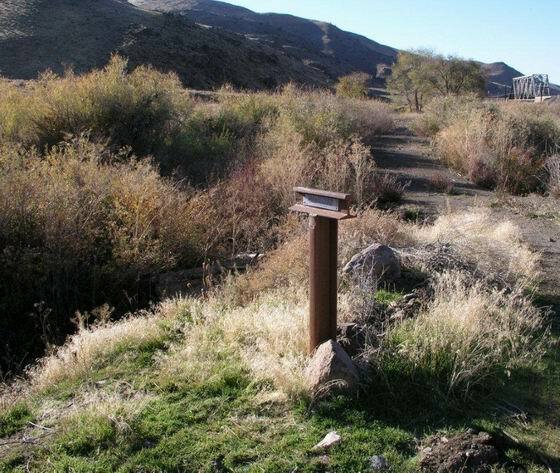 After traveling southeast along Prosser Creek for several miles, the trail turns south, crosses the creek, and climbs up a short, steep hill to a sagebrush-covered bench. As the emigrants continue southwest over the gentle, rolling, pine-forest clad, sagebrush-covered ridges, they occasionally get a glimpse of the peaks of the Sierra. Emigrant John Steele expressed his thoughts very well when he noted that the “snowy peaks rose in wild magnificence against the sky.” Photo by Bob Black. 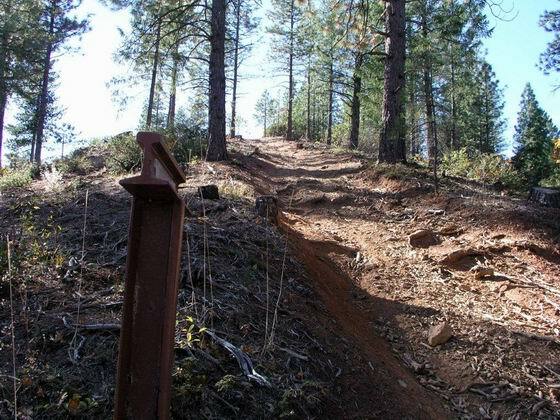 The trail heads southwest through an open pine forest before dropping down to the Truckee River. Photo by Bob Black. The trail heads southwest up a rocky ridge before dropping down to Coldstream Creek. The trail continues west up the heavily timbered valley floor on the way to the crest of the Sierra. Photo by Jim Moorman. 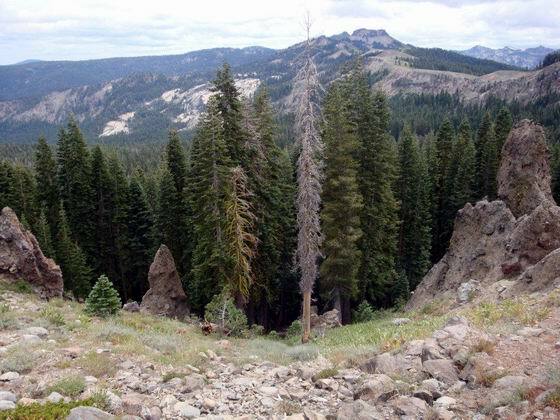 The late 1846 route of the Truckee Trail came straight up the steep, rocky hill, shown in the photo, to the top of the pass assisted by the oxen pulling from the top. This route replaced the original trail over Stephens Pass because this trail was much easier. A later route in 1849 switchbacked up the rocky slope to the left on a more gentle grade and did not require the oxen assist from the top of the pass. Photo by Bob Black. 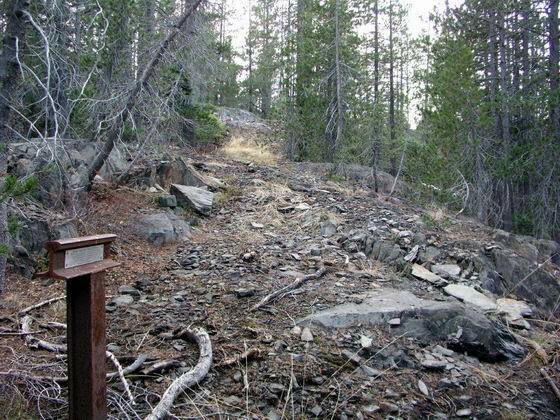 The original trail of 1844-45 came along the north shore of Donner Lake and then up the extremely rocky, nearly impassable slope to the top of the granite “wall” at Stephens Pass. One emigrant, William Todd in 1845, described the climb very well when he noted that “it was one continued jumping from one rocky cliff to another. We would have to roll over this big rock, then over that…then we had to lift our wagons by main force up to the top of a ledge of rocks.” This original trail was replaced by late 1846 with the easier alternate rail over Roller Pass. Photo by Jim Moorman. 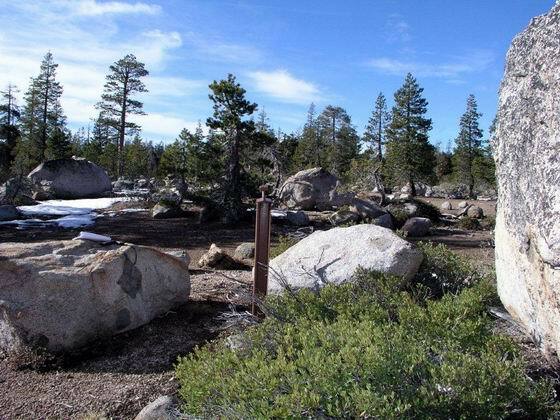 Once on top of the pass, the trail heads southwest across the massive granite boulders toward Lake Mary and the head of Summit Valley. Photo by Jim Moorman. 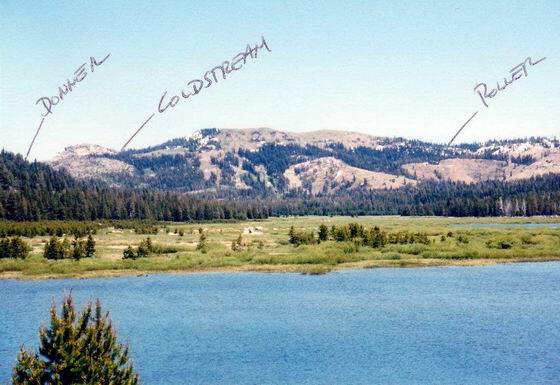 This view is east across Lake Norden, and up Summit Valley, to the crest of the Sierra. 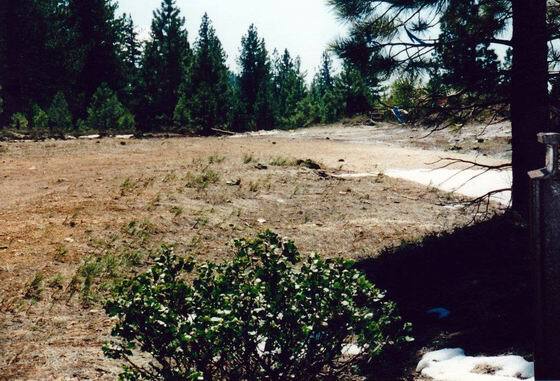 The trail from Marker T-40 came diagonally down from Stephens (Donner) Pass, from the left side of the photo, to the upper end of the valley at Marker T-41. The trail from Marker T-39 came diagonally down from Roller Pass, near the right side of the photo, to the same point. From Marker T-41, the trail route comes west down Summit Valley to Marker T-42 at the bottom-center of the photo. Photo by Bob Black. The trail continues west past several clear, cold mountain lakes before it turns south and climbs up the rocky, tree-covered slopes toward the rocky knob that emigrant Augustus Ripley called “Pinnacle Rock.” Photo by Bob Black. 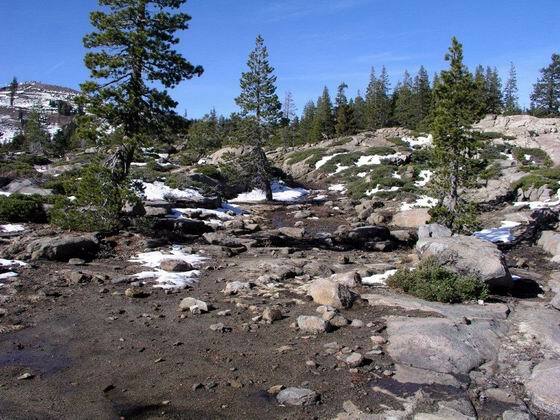 The trail continues westerly and then turns northwest and drops down from Devil’s Peak to the Yuba River. It goes along the river, over, around and down huge granite boulders in the vicinity of Big Bend. Photo by Jim Moorman. A short distance past Big Bend, a ridge came down from the south to the river’s edge. This ridge left no room for the wagons to pass so the emigrants were forced to climb up over the ridge and bypass a section of the river. Emigrant Augustus Ripley noted this when he wrote “past on down the river & valley over ledges & rocky spurs of the mountain on the left.” Photo by Jim Moorman. 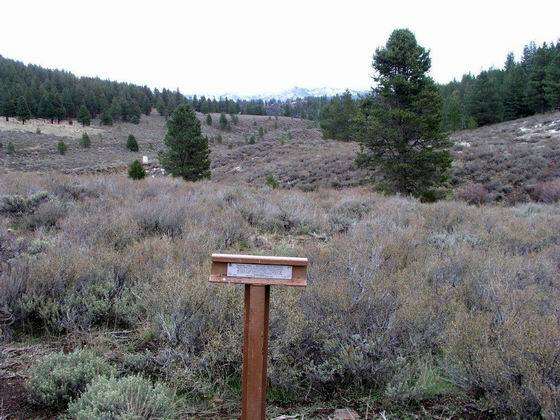 As a point of interest, the Dutch Flat Wagon Road, and the later Lincoln Highway, were constructed on top of the route of the Truckee Trail in this area. These later roads are now visible as the steep, eroded, rocky roadbed heading up the hill in the photo. The trail again leaves the river and begins the climb up out of the canyon to the bench above the river, passing by Crystal Lake on the way to Six Mile Valley and Yuba Gap. 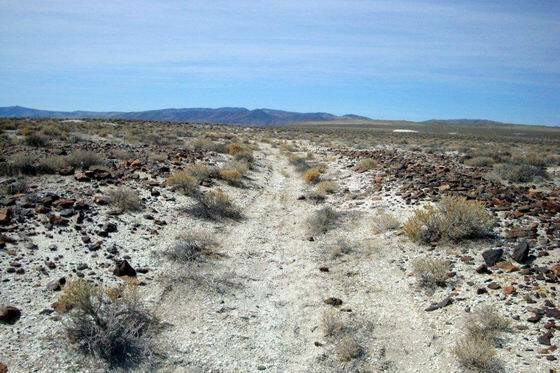 The route of the trail is defined by the old rocky, eroded roadbed of the later Dutch Flat Wagon Road/Lincoln Highway shown in the left side of the photo. 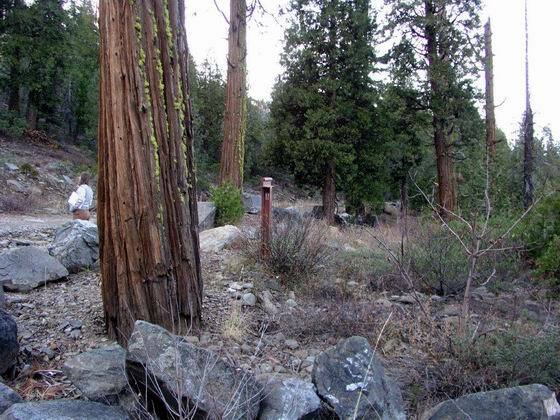 The trail passes a very large Incense Cedar along the south side of the I-80 freeway a short distance east of Yuba Gap. Photo by Bob Black. After reaching the valley, the trail route heads southwest across the valley, and present Hwy 20, as it heads toward the Bear River. 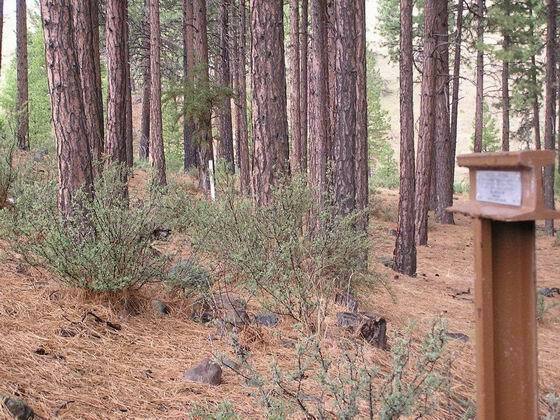 Emigrant John Prichet continues his comments: “After passing down this descent, we came to a level valley on Bear River with pretty good grass and encamped.” Photo by Jim Moorman. 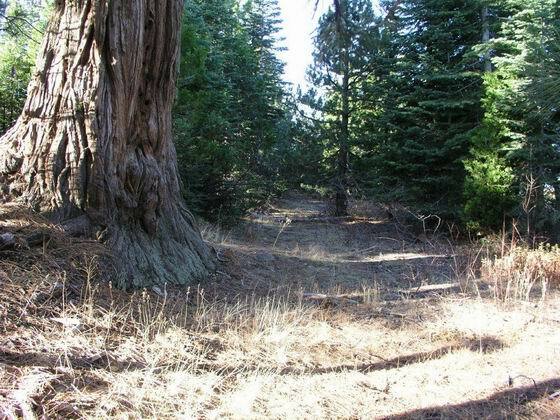 In 1850, from near Marker T-51 which is in the meadow along Hwy 20 in the center of the photo, the Nevada City Road branched off to the right and headed up the steep, heavily timbered ridge toward the west. The main Truckee Trail continued southwest down Bear Valley and then down Bear River. Benjamin Hoffman had this to say about Bear Valley: “This is a beautiful valley, about two miles in length and one half mile in width, covered with fine grass and a pure stream of water running through the centre of it.” Photo by Bob Black. After following the winding trail on down the river, the trail turns west and heads up to the top of Lowell Ridge. 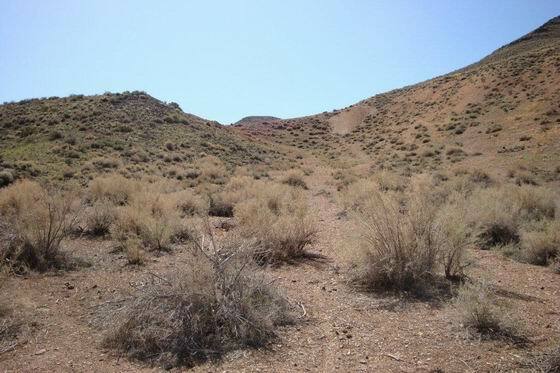 Once on top, the trail continues down the ridge and after several miles the emigrants reached Mule Springs. 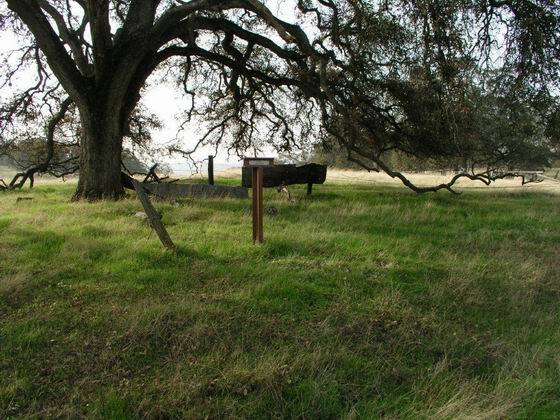 They had been expecting to find forage for their livestock in this watered area, but by September, when John Conrad arrived here, he said that “the emigrant depends entirely on the oak for cattle food.” Photo by Bob Black. After leaving Mule Spring, travel by the emigrants on the trail down the ridge becomes more difficult, as you can see by the steep section of trail shown in the photo. William Chamberlain commented that “today our road has been over a high ridge often leading over elevated peaks difficult of ascent & descent.” Photo by Jim Moorman. In the next mile or so after passing over the Camel’s Hump, the trail enters the present Christmas Tree Diggings and Little York Diggings, near Marker T-56. These areas were heavily mined many years in the past. The trail continues generally along the top of the ridge until it reaches the top of the Steep Hollow descent near Marker T-57. 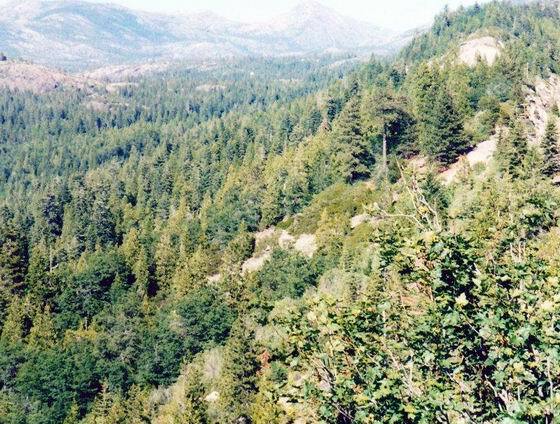 Once across the creek, the trail immediately began to ascend the steep slope, for about a half-mile, to the top of Steep Hollow Divide. Once on top, the trail turns left and heads southwest down the top of the ridge about a mile to the area of Marker T-58. It continues southwest about another mile and then turns west and drops down a side ridge, passing Marker T-59, for about 2 miles to the crossing on Greenhorn Creek. Photo by Jim Moorman. Once across Greenhorn creek, the trail continues west for about a mile as it climbs up a steep slope to the trail junction. In 1849, Augustus Burbank describes this section of the trail: “We past up a steep ascent (doubled teamed) & came to the forks of the road. The right goes by the way of Yuba & left straight on by Johnsons. We taken the left.” Photo by Jim Moorman. 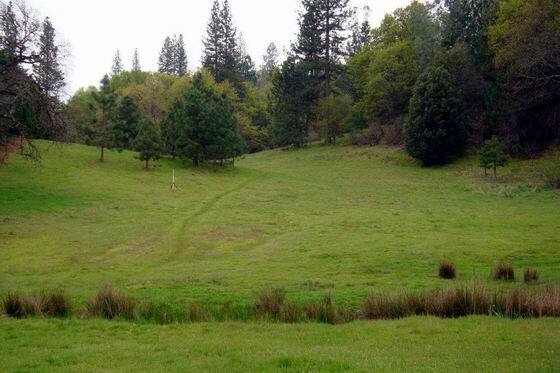 The trail heads southwest from the trail junction over rolling, oak-covered hills and small grassy meadows for several miles to Mount Olive. Since the emigrants were in country with ample grass, for the first time since leaving Bear Valley, they often laid over to recruit their livestock. Photo by Bob Black. The emigrants continue to head generally south over the oak-covered hills and down the grassy ravines, passing Markers T-62 and 63, until they reach Cedar Ravine. Here the trail turns west and continues down the open, gently-sloping ravine for about 2 miles to a ravine on the left and Marker T-64. Photo by Jim Moorman. 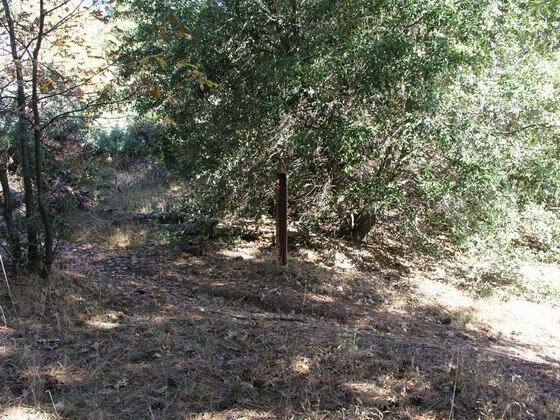 From Marker T-64 to 67, the trail continues to head southwest and west over the rolling, oak-covered slopes and down the gentle ravines, crossing over present day Hwy 49, to the western edge of the woodlands. 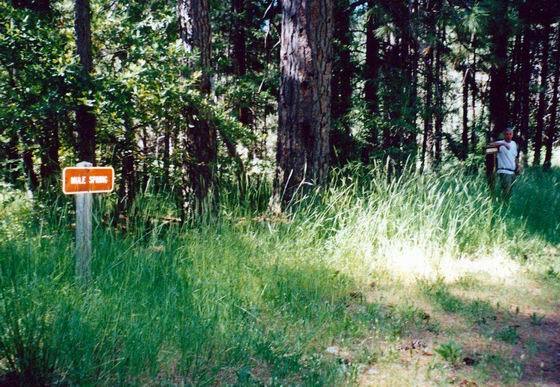 Shortly, the trail heads generally west, as the trees thin out, and the grassy, open areas become more numerous. 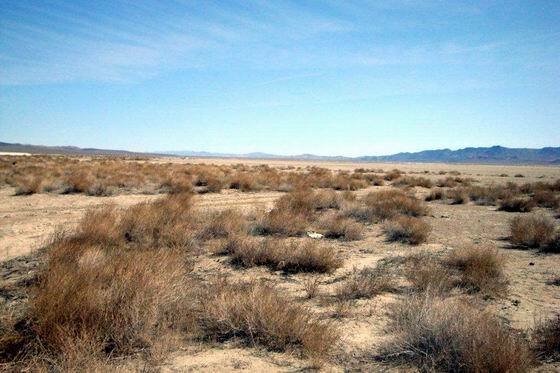 This must have been what Jacob Snyder was seeing as he wrote “we are evidently approaching the plains. The hills are decreasing in magnitude & everything indicates that we have gotten through the most difficult part of the mountains.” As the trail continues generally west, it travels down several small valleys, where this photo was snapped, and along the tops of a few ridges a mile to the northwest. Edwin Bryant noted that “after… rising and descending a number of hills, from the summit of one more elevated than the others surrounding it, the spacious valley of the Sacramento suddenly burst upon my view.” Photo by Jim Moorman. The trail is now travelling over very gentle, rolling hills where the oak trees are now quite large and scattered. 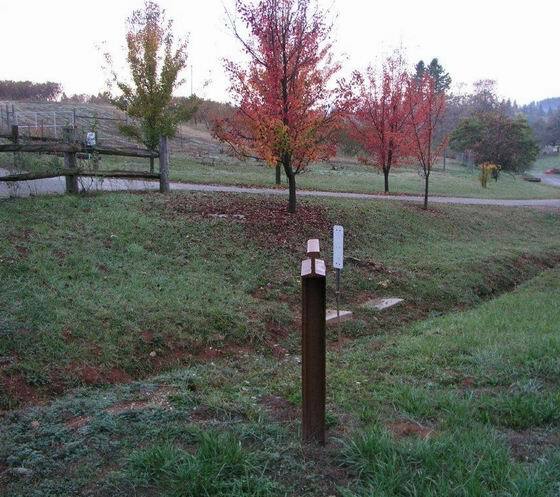 The trail makes an easy crossing on Rock Creek about a half-mile west of this location. Photo by Jim Moorman. 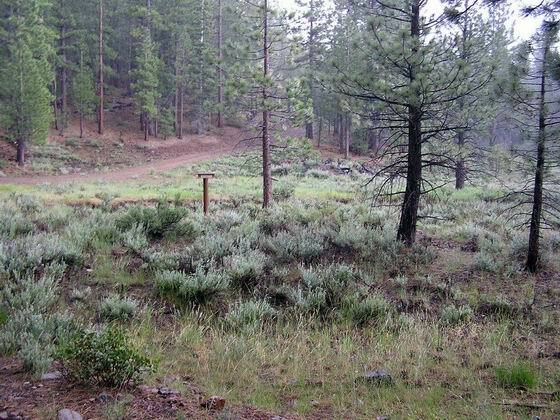 The trail is very easy to travel now as it continues southwest over the rolling, grassy slopes toward Johnson’s Ranch. The emigrants were in terrible condition but still full of determination when Benjamin Hoffman noted that “with practically no food for man or beast, and by bringing all the energy and courage which both men and beast possessed…we succeeded in…reaching the first, or Johnston’s Settlement.” Photo by Jim Moorman. 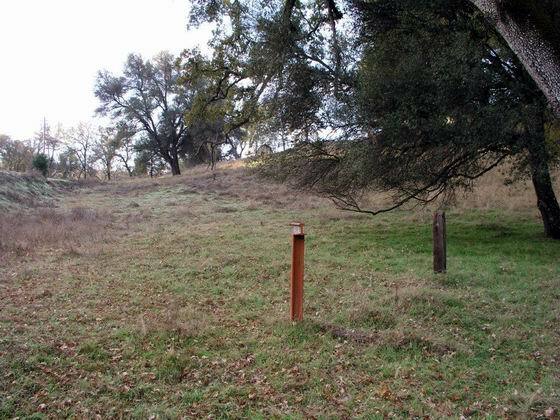 At this location, the emigrants were nearly at Johnson’s Ranch and the end of the trail. 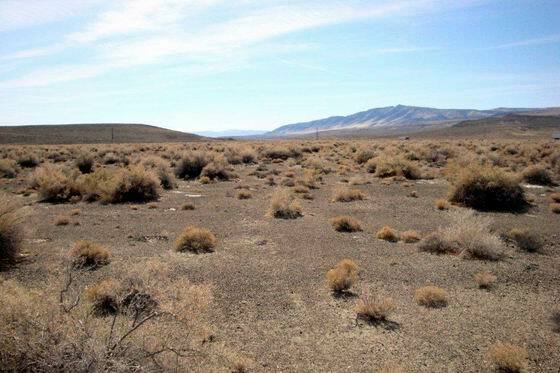 John Johnson, an emigrant who was no relation, commented that we “are now only 1 ½ miles from Johnson’s—the first settlement in California on this route…” Photo by Bob Black.